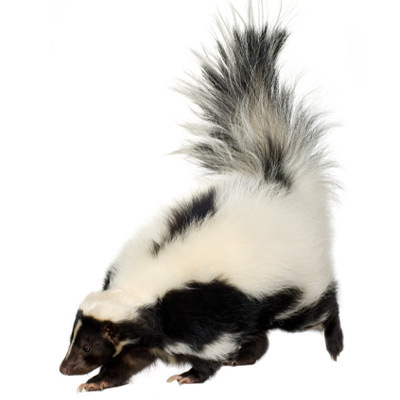 Skunk control and nuisance animals found in Massachusetts, New Hampshire and Southern Maine. In Massachusetts, New Hampshire and Southern Maine, typically only one type of skunk lives in the area – the single striped skunk. Although skunks are active year-round, they are more noticeable in the summer months. They live underground, but do not hibernate in the winter months. Skunks actually use the colder months to mate and are highly active as long as they can stand the temperatures. When skunks are looking for food, they are will get almost anywhere. They are able to climb, so having a skunk show up on your deck or porch is not uncommon. Skunks will eat just about anything from rodents and snakes to insects and grubs as well as garbage, bird seed and pet food. There are many myths of home remedies that get rid of the smell, but most are ineffective. If the smell of a skunk isn’t enough of a reason for extermination, they also destroy gardens and can cause structural damage to your property. In most cases removing the skunks with traps is the best solution. Once you identify where they are living, closing off the entrances is extremely important. The best way to prevent skunk damage is through professional extermination. (800) 525-4825 to have a trained and licensed professional remove the animal.